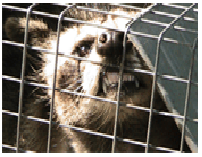 HomeRaccoon Removal Animal Control Is trapping a raccoon the best solution in a human-wildlife conflict? In most cities and provinces across Canada, it is illegal to trap and relocate an animal more than 1km. So the short answer to our question is ‘No’, but let’s find out more about how trapping works. Let’s say you live in Toronto, ON and currently have a raccoon that has made a hole in the roof vent and is living inside your attic. It travels on the fence and uses the gutter to climb up to your roof. What can you do? the first thing that pops into your mind is trapping. You buy a trap from your local hardware store and you set it up right by your fence. Now what? you sit and wait untill the raccoon is trapped. Really? Well, raccoons usually have up to five (already established) den in the same area and are known for visiting them often. That means your raccoon might not show up untill few days after you set up your trap. In the meantime you will attract your neighbourhood’s cats, skunks, and other raccoons that are just passing through. It’s not fun when you catch a skunk that is not happy for being trapped. Good luck releasing that one. But let’s say that you caught the right raccoon. If you don’t know how to transport a raccoon in your vehicle, it could end up costing you as raccoons will use their claws to dig their way out (so they think) scratching your new leased vehicle. Ok let’s say you put a board underneath the cage and took it 1 km away and for whatever reason it decided not to come back at all (which is unlikely). That hasn’t solved your problem. You still have a hole in your roof which is a good invite for another critter to take over. That’s right! it’s a loosing battle…but don’t give up yet. There are ways that you can successfuly remove the raccoon and prevent it from getting back in, all without breaking the law. Most professional raccoon removal companies use a oneway door system. This device allows the raccoon(s) to easily get out but not be able to get back in. It only opens in one direction. The hole then must be sealed with galvanized steel mesh to prevent re-entry. I’m not saying that trapping is not good at all. We recommend trapping only in rare situations where no other method of removal is possible. If you have raccoons in your attic, garage, deck or shed consult a professional wildlife control company for the best method of removal.